When Amazon added the ability to loan some purchased Kindle ebooks, I knew it wouldnâ€™t be long before we saw some new services to help people borrow & lend titles.Â A month later, there are several operating or in development. While I love the idea of being able to loan the few books Iâ€™ve purchased, the restriction on loaning a title only once will turn me into more of a hoarder than a lender. If Iâ€™m going to loan a title that I really enjoyed, I want to loan it to a friend, a good friend. And not just any good friend, but that one very good friend who will love the book the most. And the one who can get through it in the limited 14 days. Donâ€™t bother loaning me anything, Iâ€™m a slow reader. Nevertheless, with the help of Bobbi Newmanâ€™s list of ebook loaning services as a starting place, I decided to check out some of the services. This service grew out of Facebook page started on December 31,2010 by Kindle user Catherine MacDonald and has a very easy to use interface. Sign in with your Facebook account or register with your email. 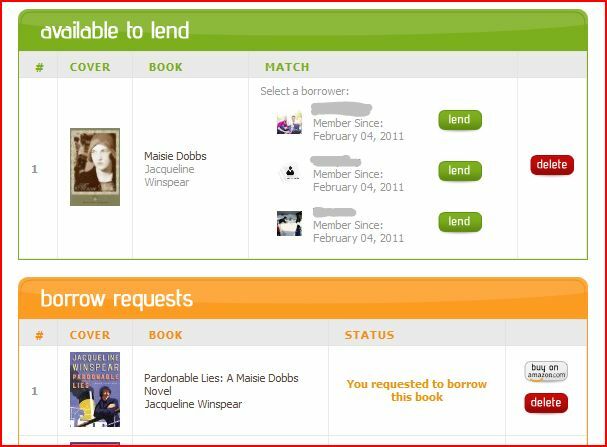 Loaning a book is simple, search for the title and click on LEND. If there are people looking for that title, youâ€™ll see a list of who wants it. You can check out their profile and also link to their Facebook account if they used that to sign up. Pick a recipient and you arrive at the Amazon page for the title. A banner at the top of the screen neatly steps you through sending an email to the recipient letting them know the Kindle book has been loaned to them. The borrower has 7 days to pick up the loan, then 14 days to read it. Note that your book is unavailable to you at this point and throughout the loan period. One thing confused me, I received an email from KLC saying someone wanted to borrow my book. I followed the link and found the same 3 people waiting to borrow it, but no indication of who had triggered that email. Searching for a book to borrow was just as easy, search and click on BORROW. But thereâ€™s no way to tell if anyone has actually offered the book. All you know is whether the publisher has allowed the book to be loaned. Note that itâ€™s the publishers who make that decision, not Amazon.Â I asked for a couple of titles, but have no idea if Iâ€™m ever likely to get them. Maybe this is information that will be added in the future? Lending & borrowing are free. KLC doesnâ€™t make any money directly from members, only through the Amazon Affiliate program. Iâ€™m very impressed with how quickly this service was put together and how easy it is to use.Â Interview with Catherine MacDonald about the project. This service handles loans of Barnes & Noble’s Nook ebooks. Sign in with your Twitter, Facebook or Google account. Search for a title and click to indicate if you want to borrow or lend. Also has a handy BUY button. 🙂 The number of copies available for loan and the number of people waitingÂ to borrow are also noted, which gives you a sense of what your chances are of getting the title. Iâ€™ve requested a title that has lots of lenders and just a few people waiting. Will see what happens. I donâ€™t have any Nook books to loan right now, so I wasnâ€™t able to test that side of the process. This service uses a point system to determine who gets a title first. The person with the most points goes to the top of the queue. You earn points by loaning books and other activities on the site. Book lending and borrowing are both free though. Free borrowing & lending of Kindle and Nook books. Very easy to use. Look for a title to borrow, if itâ€™s available the buttons for borrowing are highlighted in blue. The lender has 48 hours to let you know if youâ€™re going to get the book. Members can borrow up to 3 books at a time. I’ve requested one book, but haven’t offered any for loan yet. Refer to hoarder instincts noted above! Affiliated with the BookSwim book rental service, ebookfling offers Kindle and Nook books and appears to still be in a testing phase. You canâ€™t do anything more than add books to a list at the moment. The promo material on the site says that users will earn credits for each book loaned and that can then be used to borrow a book. If you donâ€™t have credits, youâ€™ll be able to buy them for $1.99. This is another service that is in private beta. I signed up for an invitation so I can check it out. I donâ€™t see any other information at this point. 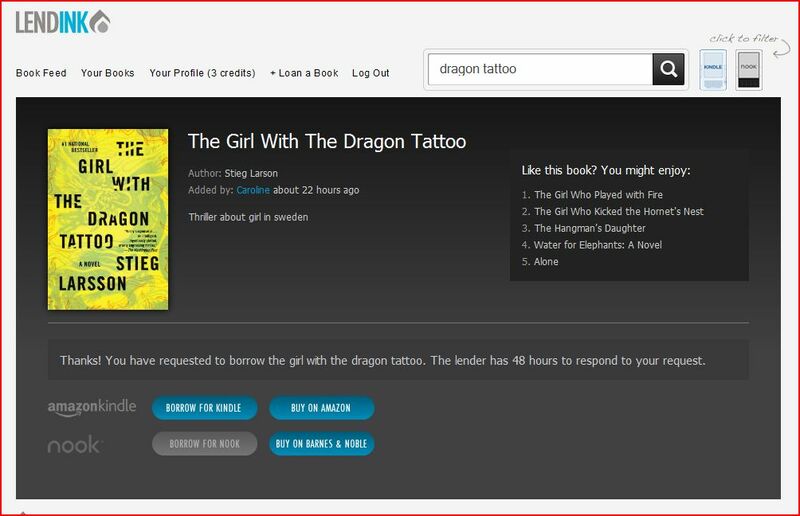 An example of a grassroots sharing service is ebooklendinglibrary forum where members can swap books using EBDs (ebook lending dollars) that are earned by lending books, writing reviews and other activities. And people are also adding tags/collections/bookshelves to their online book sharing profiles toÂ let their friends know what books they have availalble to lend.Â I’ve seen this in GoodReads and imagine people are doing it in LibraryThing as well.Â Â Librarything also has a Nook eBook Exchange group. I didn’t find a similar Kindle group, but it may be there. An update: I’ve had the best experience so far with Lendle.me. Within minutes of requesting a book, I received notice of it being available. That may have just been dumb luck that the loaner was responding to email quickly. Am going to try another loan and see how that goes!